This evening I was attracted by some birds calling outside. I went to investigate, thinking that they were probably Rainbow Lorikeets. I didn’t take my camera with me. Sure enough, I had some good views of two Rainbow Lorikeets in the tree next to our driveway. The seeting sun was lighting up the brilliant colours of one of them. I needed my camera. It was still inside. I casually walked inside trying not to scare the birds away by sudden movements. On emerging with the camera the lorikeets had disappeared – of course! 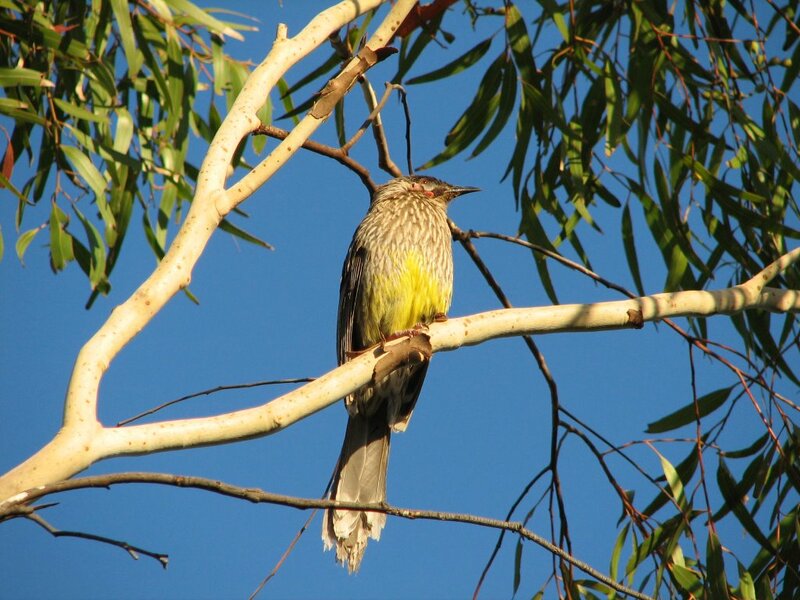 Instead, I was content to get some very good shots of a Red Wattlebird in the setting sun in the same tree. It almost seemed like he was posing for me. Perhaps the lorikeets had persuaded him to pose for them, because as I walked inside, they emerged from a nearby tree and flew a sortie overhead, screeching their taunts at me. One day, one day I’ll get a good shot of them. Rainbow Lorikeets are quite common throughout the urban areas of Murray Bridge but we only occasionally see them on our home block on the outskirts of the city. In recent weeks they have been daily visitors. This indicates that there has to be enough plants flowering around here to attract these beautiful, but noisy, birds. On this morning’s walk a had good views of two Elegant Parrots. This beautiful species is widespread in this area but they are not common anywhere. I also saw a single Adelaide Rosella. These are common in the Adelaide region and this is the eastern extent of their range and are uncommon in Murray Bridge. If I’d had my camera with me I would have been able to get an excellent photograph of a Rainbow Bee-eater sitting on a gate in the early morning sun. Tomorrow – I’ll take my camera on my walk.